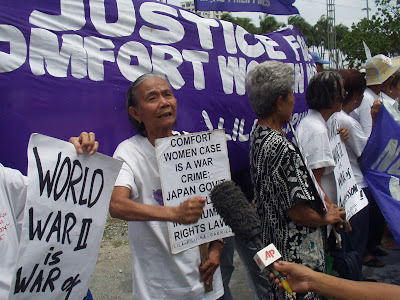 Lola Narcisa Claveria, along with other members and advocates of LILA Pilipina, protest before the Japanese Embassy in the Philippines. She is still waiting for a direct and unequivocal apology from Japan. The PHILIPPINE INQUIRER reports that Philippine Representatives Liza Maza and Luzviminda Ilagan of the Gabriela Women’s party-list, Satur Ocampo and Teodoro Casiño of Bayan Muna (People First), Crispin Beltran of Anakpawis (Toiling Masses), Eduardo Zialcita of Parañaque, and Neil Tupas of Iloilo filed Resolution 124 following the US House of Representatives’ adoption of a similar measure.